Our above ground pools consist of four different packages. Below is the list of items included in each package we offer. maintenance kit- vaccum head, hose, pole, ect. maintanence kit- vaccum head, hose, pole, ect. This Garden Leisure pool brings together economy-of-cost and quality construction design for an excellently valued pool. This Doughboy pool incorporates a stunning, three-dimensional, granite-like frame design with an attractive taupe color scheme. •Zinc Clad 11000 with Hot Dipped Galvanizing for protection and corrosion resistance. •Custom-blended Polyethylene construction for strength. •Snap-Lock Type Frame Construction for easy assembly and maximum strength. This Doughboy pool features a beautifully designed wall with resin top rails and verticles. A lifetime of memories will be gained in your backyard. • Zinc Clad 11000 with Hot Dippe Galvanizing and protective coatings against corrosion. 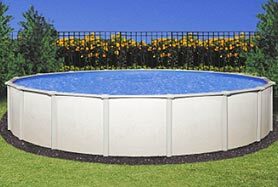 This Doughboy pool features a soft curved frame with a beautiful pattern. It will add an elegant simplicity to your back yard. • Beautifully crafted resin top rails. • Elegantly designed vertical Supports. • Zinc Clad 11000 with Hope Dipped Galvanizing for protection. • Resin components provide durability and longevity. • Industry leading top rails. • Massive Steel-Reinforced, resin columns. • Zinc Clad 11000 with hot dipped galvanizing for protection against corrosion. •Rugged Resin components for durability and longevity. This is an Aquarian pool with design-inspired Tuscan walls. Khaki posts and top ledges add a graceful touch. It features a 7" resin ledge, durable 6" upright posts, interlocking resin caps, and resin foot collars which all give it strength and durability. The frame is galvanized steel with a polyester finish and liquid vinyl coating. This Aquarian pool adds a sophisticated touch with graceful, classic Bristol walls. The Hampton pool is built to withstand the seasons. It features 9" resin ledges, durable 6" upright columns with interlocking resin caps, and resin foot collars for strength. The columns are galvanized with a liquid resin coating.